Body Size: 20x10x6mm/0.79"x0.39"x0.24"(L W T);Lever Length: 18mm/0.71";Certification: CE,CCC,UL,VDE. Description:Easy to install and easy to use.Good-looking and long life expendency.Widely used to control operation of many small power electronic projects, including volume and other controls for audio video, dimmer controls for lights. etc. Description: Easily welding to the circuit. The Touch Switch is widely used in the electric toy, sound equipments, fax, test instrument equipments, or other low voltage circuit electronic equipments. Description: Easy to install and easy to use. Good-looking and long life expendency. Widely used to control operation of many small power electronic projects, including volume and other controls for audio video, dimmer controls for lights. etc. Description: Widely used to control operation of many small power electronic projects, including volume and other controls for audio video, dimmer controls for lights. etc. Unit: mm Description: There are 40 Pcs sliding switches here, thay are 3 terminals, SPDT action type and on/off 2 positions. Widely used to control operation of many small power electronic projects, including volume and other controls for audio video, dimmer controls for lights. etc. Description: 1.Easy to install and easy to use. 2.Good-looking and long life expendency. 3.Widely used to control operation of many small power electronic projects, including volume and other controls for audio video, dimmer controls for lights. etc. Specification: Product Name: Slide Switch Position: 2 Knob Height: 6mm / 0.24 inch Action Type: Latching Contact Type: 2P2T Terminal Quantity: 6 Hole Diameter: 2.3mm Main Body Size: 15.6 x 7.6 x 7mm / 0.61 inch x 0.3 inch x 0.28 inch (L*W*H) Package Content: 5 Pcs x Slide Switch. Description: 1.Easy to install and easy to use. 2.Good-looking and long life expendency. 3.Widely used to control operation of many small power electronic projects, including volume and other controls for audio video, dimmer controls for lights. etc. Specification: Product Name: Slide Switch Position: 2 Knob Height: 7mm / 0.28 inch Action Type: Latching Contact Type: 2P2T Terminal Quantity: 6 Hole Diameter: 2.3mm Main Body Size: 15.6 x 7.6 x 7mm / 0.61 inch x 0.3 inch x 0.28 inch (L*W*H) Package Content: 15 Pcs x Slide Switch. Description: Easy to install and easy to use. Good-looking and long life. Widely used to control operation of many small power electronic projects, including volume and other controls for audio video, dimmer controls for lights. etc. Description:1.Easy to install and easy to use.2.Good-looking and long life expendency.3.Widely used to control operation of many small power electronic projects, including volume and other controls for audio video, dimmer controls for lights. etc. Specification:Product Name: Slide SwitchPosition: 2Knob Height: 5mm / 0.2 inchAction Type: LatchingContact Type: 1P2TTerminal Quantity: 3Hole Diameter: 1.6mmMain Body Size: 10.5 x 5.6 x 5mm / 0.41 inch x 0.22 inch x 0.2 inch (L*W*H) Package Content:10 Pcs x Slide Switch. Descriptions: Features: DIP type, 2.54mm pitch, 2 positions 3 terminals DIP switch Used on a printed circuit board along with other electronic components and is commonly used to customize the behavior of an electronic device for specific situations. Widely used in data processing, communication, remote control and anti-theft alarm system need to manually automatic programming products. 3PDT = Three Pole Double Throw (Double throw is another way of specifying Change Over). Dolly Ht 6.8mm Profile 4 x 1.8mm. Slot required 10 x 2mm. Description: 1.Easy to install and easy to use. 2.Good-looking and long life expendency. 3.Widely used to control operation of many small power electronic projects, including volume and other controls for audio video, dimmer controls for lights. etc. Specification: Product Name: Slide Switch Position: 2 Knob Height: 5mm / 0.2 inch Action Type: Latching Contact Type: 2P2T Terminal Quantity: 8 Hole Diameter: 2mm Main Body Size: 15.6 x 6 x 5mm / 0.61 x 0.24 x 0.2 inch (L*W*H) Package Content: 20 Pcs x Slide Switch. Description: 1.Easy to install and easy to use. 2.Good-looking and long life expendency. 3.Widely used to control operation of many small power electronic projects, including volume and other controls for audio video, dimmer controls for lights. etc. Specification: Product Name: Slide Switch Position: 2 Knob Height: 5mm / 0.2 inch Action Type: Latching Contact Type: 1P2T Terminal Quantity: 3 Hole Diameter: 1.6mm Main Body Size: 10.5 x 5.6 x 5mm / 0.41 x 0.22 x 0.2 inch (L*W*H) Package Content: 10 Pcs x Slide Switch. Description: 1.Easy to install and easy to use. 2.Good-looking and long life expendency. 3.Widely used to control operation of many small power electronic projects, including volume and other controls for audio video, dimmer controls for lights. etc. Specification: Product Name: Slide Switch Position: 2 Knob Height: 5mm / 0.2 inch Action Type: Latching Contact Type: 1P2T Terminal Quantity: 3 Hole Diameter: 2.3mm Main Body Size: 15.6 x 7.6 x 7mm / 0.61 inch x 0.3 inch x 0.28 inch (L*W*H) Package Content: 29 Pcs x Slide Switch. Description: Slide Switch is for changing circuit by sliding the mini handle of the switch to control the circuit, thay are 3 terminals, SPDT contact type and on/off positions. Widely used to control operation of many small power electronic projects, including volume and other controls for audio video, dimmer controls for lights. etc. Description: 1.Easy to install and easy to use. 2.Good-looking and long life expendency. 3.Widely used to control operation of many small power electronic projects, including volume and other controls for audio video, dimmer controls for lights. etc. Specification: Product Name: Slide Switch Position: 2 Knob Height: 5mm / 0.2 inch Action Type: Latching Contact Type: 1P2T Terminal Quantity: 3 Hole Diameter: 2.3mm Main Body Size: 10.5 x 5.6 x 5mm / 0.41 x 0.22 x 0.2 inch (L*W*H) Package Content: 50 Pcs x Slide Switch. Description: Easily welding to the circuit. 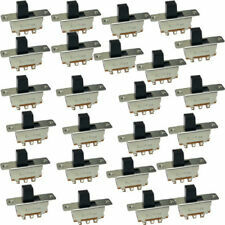 Slide Switch is for changing circuit by sliding the mini handle of the switch to control the circuit to be ON or OFF. 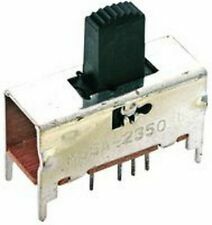 The Slide Switch is widely used in the electric toy, sound equipments, fax, test instrument equipments, or other low voltage circuit electronic equipments. Description:Features: Easy Structure, Mini Body, 6 Terminal, Vertical Handle, DPDT 2 Position, Sliding Knob Actuator.Widely used to control operation of many small power electronic projects, including volume and other controls for audio video, dimmer controls for lights. etc.Also a great component for DIY. Specification :On-On 3P, SPDT, 2A 250VAC, 5A 120VAC. Actuator heigh : 5.08mm. Slide switch. Cnntact material :Brass with silver plated. Pins Lead :PC thru-hole. RoHS & Lead Free : Yes. Hope you can understand. Description:1.Easy to install and easy to use.2.Good-looking and long life expendency.3.Widely used to control operation of many small power electronic projects, including volume and other controls for audio video, dimmer controls for lights. etc. Specification:Product Name: Slide SwitchPosition: 2Knob Height: 4mm / 0.16 inchAction Type: LatchingContact Type: 1P2TTerminal Quantity: 3Main Body Size: 12x 6 x 13mm / 0.47 x 0.24 x 0.51 inch (L*W*H) Package Content:50（ /-2%） Pcs x Slide Switch. Description:1.Easy to install and easy to use.2.Good-looking and long life expendency.3.Widely used to control operation of many small power electronic projects, including volume and other controls for audio video, dimmer controls for lights. etc. Specification:Product Name: Slide SwitchPosition: 2Knob Height: 6mm / 0.24 inchAction Type: LatchingContact Type: 1P2TTerminal Quantity: 3Main Body Size: 9x 7.5x10.5mm / 0.35 x 0.3 x 0.41 inch (L*W*H) Package Content:100( /-2%) Pcs x Slide Switch. Description:1.Easy to install and easy to use.2.Good-looking and long life expendency.3.Widely used to control operation of many small power electronic projects, including volume and other controls for audio video, dimmer controls for lights. etc. Specification:Product Name: Slide SwitchPosition: 2Knob Height: 4mm / 0.16 inchAction Type: LatchingContact Type: 1P2TTerminal Quantity: 3Main Body Size: 13x 9 x 11mm / 0.51 x 0.35 x 0.43 inch (L*W*H) Package Content:100（ /-2%） Pcs x Slide Switch. Description: 1.Easy to install and easy to use. 2.Good-looking and long life expendency. 3.Widely used to control operation of many small power electronic projects, including volume and other controls for audio video, dimmer controls for lights. etc. Specification: Product Name: Slide Switch Position: 2 Knob Height: 6mm / 0.24 inch Action Type: Latching Contact Type: 2P2T Terminal Quantity: 6 Hole Diameter: 2.3mm Main Body Size: 15.6 x 7.6 x 7mm / 0.61 inch x 0.3 inch x 0.28 inch (L*W*H) Package Content: 10 Pcs x Slide Switch. Description: 1.Easy to install and easy to use. 2.Good-looking and long life expendency. 3.Widely used to control operation of many small power electronic projects, including volume and other controls for audio video, dimmer controls for lights. etc. Specification: Product Name: Slide Switch Position: 2 Knob Height: 7mm / 0.28 inch Action Type: Latching Contact Type: 2P2T Terminal Quantity: 6 Hole Diameter: 2.3mm Main Body Size: 15.6 x 7.6 x 7mm / 0.61 inch x 0.3 inch x 0.28 inch (L*W*H) Package Content: 10 Pcs x Slide Switch. Description: 1.Easy to install and easy to use. 2.Good-looking and long life expendency. 3.Widely used to control operation of many small power electronic projects, including volume and other controls for audio video, dimmer controls for lights. etc. Specification: Product Name: Slide Switch Position: 2 Knob Height: 6mm / 0.24 inch Action Type: Latching Contact Type: 2P2T Terminal Quantity: 6 Hole Diameter: 1.6mm Main Body Size: 15.6 x 7.6 x 7mm / 0.61 inch x 0.3 inch x 0.28 inch (L*W*H) Package Content: 10 Pcs x Slide Switch.